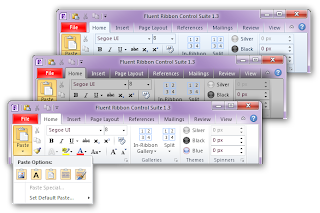 I've been looking into implementing a ribbon control, and found that Microsoft have released the source for there 2010 ribbon! (The 2010 Ribbon is also known as a "Scenic" Ribbon style). Great stuff, thanks Microsoft! 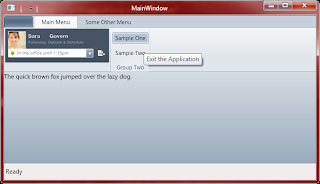 Microsoft also have a page describing what the different components of the ribbon are and when it should be used: Ribbon WPF and also some common application UI patterns and usage recommendations. There is full support for the MVVM pattern in the ribbon and support for ICommand. Here's one I have started to customise to push the ribbon to the right to make space for companion panel I want to sit next to the ribbon. Looking at it from a code difficulty point of view and amount of code required, Fluent is definitely easier and you write about 30% less code than what is required for the Microsoft WPF Ribbon. However, the Microsoft offering seems to be faster, and has better support for MVVM. I am also looking into Infragistics .NetAdvantage 2010 Volume 3, which includes (as of October 2010 I believe) a "Scenic" Office 2010 style Ribbon Bar. It also has a cool feature called ColorWash which allows a measure of control over the color scheme of the bar. It looks pretty cool on the surface but it doesn't give you exact control over the resulting color. Which I found quite annoying. I found it far too hard to restyle this to be a black scheme. Infragistics have only given one simple Office 2010 style, the blue "Scenic" style. Seems like the Henry Ford approach, "...you can have any color as long as its black...". Finally the overall style does not seem to match closely the Office 2010 style, it seems a little over simplified. The above example has set the Wash Color to Black. But this is still no where near dark enough, and doesn't give me the control I want. 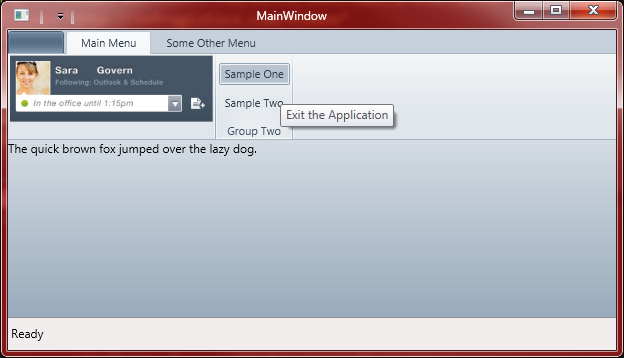 For example changing the background to a different gradient fill. You can also see the style is subtly simpler than the Fluent and Microsoft images above. My verdict? In my humble opinion Infragistics comes in at third on this one. It feels like they have retro fitted 2010 styling rather than considering all the features in the Office 2010 Ribbon. Fluent is very good and seems easy to use but there are a few tiny things missing in comparison to Microsoft. However, if ease of implementation is what you're after Fluent looks like the way to go. Me personally, I need all the features Microsoft has over Fluent (Keyboard Navigation, full control of Backstage, and mini-toolbar and shortcut tool-bar).